You only have time on weekends? Within about 4 hours from Kampala lies one of the smaller national parks of Uganda, Lake Mburo National Park. Every Saturday we have a departure! Ideal for a weekend of adventure. If you have your own group or a romantic getaway for 2 😀 then you can choose your own departure date. Because poaching is almost done, this park has a lot of animals within her boundaries. 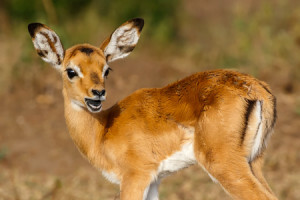 It is the only park in Uganda where impalas live. During game drives you will see plains zebra, one of the largest antelopes in Africa the eland, lots of bushbuck, Defassa waterbuck, topi, common duiker, warthogs and smaller mammals like dwarf mongoose and marsh mongoose. After an absence of years lions can be found again, but you need a lot of luck to see them. Leopard and spotted hyena are also residents of the national park. Lots of birds can be found too during a game drive in the park. In the papyrus swamps the mysterious shoebill breeds and the shores of Lake Mburo belong to the best places in Uganda to see the African finfoot. So, don’t forget to make a boat trip on the lake. Our Nature Lodges accommodation Mburo Eagles Nest is situated on a hill top, just outside the park. Have a drink and watch the animals on the slopes of the hill. Unforgettable. Gamedrives and walks in the park, see lions, leopards, giraffes, Ugandan kobs, elephants, shoebill storks, etc. Boatride on Lake Mburo, see the animals at the waterfront!